Tells the story of the first London Blitz - six raids by German bombers in eight nights in 1917. This title focuses on the events of August 1918 and the countdown to the incendiary raids that would have destroyed much of London and Paris had they not been called off at the very last minute. 'Fighting was raging on the other side of the Channel, but in London, in the warmth of a drowsy late-September afternoon, the war seemed a long way away. The roads were strangely quiet and deserted, for petrol restrictions had reduced motor traffic almost to zero. London seemed breathless, in the tense expectancy of disaster. The alarm was given soon after nightfall. At Biggin Hill and a score of other airfields, pilots scrambled from their quarters and sprinted for their aircraft. Within seconds the air was full of the noise of engines, as the squadrons taxied out and took off into the ever-darkening sky'. 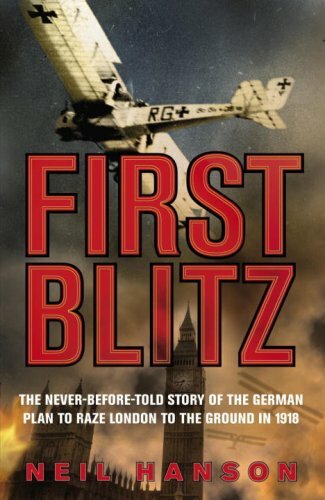 "The First Blitz" is told in two parts, each detailing the events of a single week. The first part tells the story of the first London Blitz - six raids by German bombers in eight nights in 1917. Part two focuses on the events of August 1918 and the countdown to the incendiary raids that would have destroyed much of London and Paris had they not been called off at the very last minute.